Truck manufacturers provide consumers with certain ratings to help determine the capacities of the truck, as manufactured. Some of these ratings are posted on the driver's side door jam, on a label in the glove box, or in the owner's manual or other literature. If you already own a truck that you intend to use for a camper, it's always wise to take it to a commercial truck scale to determine the actual weight of the truck. That information along with your truck capacity information will help you determine the remaining capacities for carrying and/or towing. Camper weights both dry and wet vary depending on what optional equipment you have installed and how full your holding tanks are. Also, take into consideration the weight of passengers, gear and trailer tongue weight (if applicable). Truck and camper package handling can be greatly improved by the addition of support equipment like air springs, special shocks absorbers, and cabover shocks. Your Lance dealer can properly install all the needed support equipment. Maintaining maximum tire pressure on quality tires with ratings equal to, or better than, your original tires is also helpful. (Usually Found on the Driver Door Jam) The value set by the truck manufacturer as the loaded weight of the vehicle plus the loaded weight of any trailer it tows. 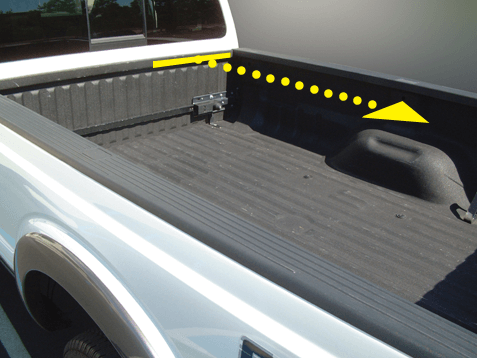 The GVWR, GAWR for the front axle and GAWR for the rear axle are generally posted by the manufacturer on the truck door post or in the glove compartment. The manufacturer determines the GVWR, GAWR and CGVWR at the time of manufacture and manufacturers are unwilling to change this number once the vehicle is built to a dealer or sold even if modifications have been made to the truck. The value set by the truck manufacturer as the loaded weight of a single vehicle. The value set by the truck manufacturer as the load-carrying capacity of a single axle system. There is a separate (and different) GAWR for the front and rear axles. The value set by the truck manufacturer as the loaded weight of the vehicle plus the loaded weight of any trailer it tows. We've found over many years of experience with trucks and campers that there are certain modifications and additions in the form of dealer-installed support equipment that can be made to the truck/camper package to improve safety and handling. These include adding air springs, cabover shocks, and special truck shocks along with upgraded tires. While support equipment does not increase the factory ratings of GVWR, GAWR and CGVWR, they do improve the handling and stability of the truck while driving and the ability of the truck to handle greater loads safely. The first step is to determine the load carrying capacity of your truck by taking the truck to any commercial weight station and obtain weights for the total truck and the weight on each axle. At the time of weighing, the fuel tanks should be filled and the driver and expected normal number of passengers should be in the truck cab. The total weight of the truck subtracted from the truck's GVWR will be the cargo weight the truck can carry. To determine the approximate weight of a camper, add the weight of all optional equipment (both factory- and dealer-installed) to the camper wet weight that’s posted next to the camper's entry door. Also add the weight of supplies, personal gear and other cargo that might be carried in the camper or truck. You can also use the Get A Quote link to get an approximate weight of the model of your choice with options. For complete information and professional guidance on matching your truck to a camper, please consult your nearest Factory Authorized Lance Dealer. They'll be happy to assist you. Because Lance is unfamiliar with your specific truck and how you intend to use it, Lance Camper Manufacturing Corporation makes no warranties or representation express or implied as to the performance or reliability of your truck with a Lance camper. The "Lance Match Maker" is designed to assist you in matching your truck and camper correctly. Make sure to review all of the information in the guide above. For additional disclaimers, CLICK HERE to read the disclaimers in the truck camper section of the Warranty page.